Aikido is a modern japanese martial art. It has been developed in the middle of the 20th century by Ueshiba Morihei (1883-1969) based on different Budo disciplines. Aikido is a defenive martial art and does not aim at the destruction of the attacker. Instead, its goal is to convince the opponent of the meaninglessness of its attack. Even if the aspect of a quick-to-learn self-defense is not in the foreground, Aikido can be used effectively after sufficient progress. Aikido includes a great variety of defensive techniques against different forms of attack. Advanced students also train with weapons (wooden sword, stick, knife) to sharpen their sense of distance, timing and initiative. For beginners, learning the typical Aikido forward and backward rolls, important basic movements and first basic techniques are in the foreground. Aikido is a special Japanese kind of budo that trains both body and mind and is completely different from European sports. In Aikido there are no competitions. Aikido is suitable for men and women alike. It is practiced without pressure in mixed groups. If you want to take a look at aikido, there are many videos for example on YouTube. Aikido was by no means developed out of “nothing” by Ueshiba Morihei, called O-Sensei (great teacher). The martial art Daitō-ryū, which Ueshiba studied intensively, was the basis that he developed over time. Centuries passed, during which the techniques changed and the philosophical background became more important. Finally, after various other names, Ueshiba called the martial art he taught “Aikido”. 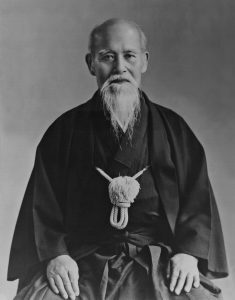 During his long life, Ueshiba has trained many students. The aikido style and character of the techniques, which these students in turn have passed on and spread as great masters, are largely determined by when they were taught by Ueshiba. This results in a huge variety of Aikido styles, which sometimes differ greatly. There is not really a right or a wrong. The different styles each set different priorities in the field of techniques, philosophy and effectiveness. They often impart the same principles in different ways. Sometimes they propose divergent principles due to a different understanding of the martial art Aikido. Many of the great Aikido masters have established their own associations over time. Many of the associations maintain a friendly and close relationship with the Aikikai Honbu Dojo in Tokyo, which is currently headed by Ueshiba Moriteru, grandson of the Aikido founder. Many associations are recognized by the Aikikai Honbu Dōjō and may also award Dan graduations in his name. Other associations go their own way.